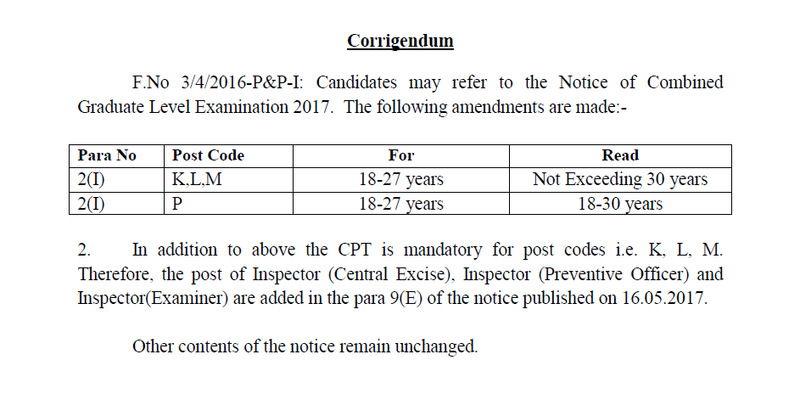 Dear Readers, The Staff Selection Commission has issued a notice regarding the Age criteria for some posts. It was controversial, hence SSC has resolved the disputed part. →The upper age limit has been increased to 30 years. →In addition to above the CPT is mandatory for post codes i.e. 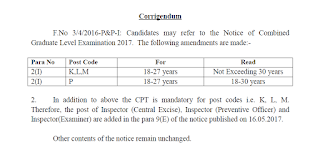 K, L, M.
→Therefore, the post of Inspector (Central Excise), Inspector (Preventive Officer) and Inspector (Examiner) are added in the para 9(E) of the notice published on 16.05.2017.